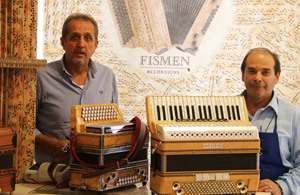 Fismen = “Fis”armonica (fisarmonica is Italian for accordion) Men (the MEN of the ACCORDION). Q: Silvano – when did you first become involved with the accordion? A: I had started to work with the accordion already, at the very early age of 14 years. It was very difficult to study at that period, as one would have to leave our small city of Castelfidardo. At that time, there were only a few big accordion factories…. I was working for Titano Victoria, Manager Mr. Lelio Picchetti for about 15 years. I started to learn all different steps of the accordion production and then I specialised on the registers, the bass mechanics - standard bass and free bass and the many different types of keyboards that they manufactured. Q: Luciano – you also started as early as Silvano? A: Nearly – my first introduction to accordion, when I was 16 years, was starting to work for the Elka company and then moving on later to the company SEM. At that time, as was usual, I had to follow up and study and learn each process of accordion manufacture. I was learning from this age, each necessary step needed to make a complete accordion. Q: So you were both working at an early age in 2 different companies – when did you meet to combine your efforts? A: In 1986, we both went individually to work for another company – the same company, and working there, we got to know each other. This continued until we decided in 2000, to dedicate all our attention to creating our own accordion manufacturing business. Q: So at the time (in 2000) , that you decided to start a new business – generally the economic situation of the world and accordion factories was not exactly the most convenient time to start a new accordion manufacturing business. A: It was a difficult period, but we felt ready to do it. We already had some very good contacts and we were confident. We have changed many things during our manufacturing, but never regretted any of our steps as we have working steadily up in our way. When we started the business, we were 6 people working and now we are 13. Q: When you started your own business, did you immediately move into this beautiful big factory? A: No, we moved step by step. Only after consolidating our business, did we take the big step of constructing this new fabrication building. This was a very major step and had very important benefits for efficiency with much nicer working conditions, improved manufacturing organisation, excellent office space and a very nice area to display our accordions. Q: What is your main production? A: As we have been working so many years in the field of traditional instruments, we are focusing even more now, to maintain OUR tradition and make the very best of our many years experience - to the joy of the accordionists performing on our instruments. Never the less, we are also enlarging our regular production line with new model instruments because of customer requests, extending our classical and chromatic accordions range. 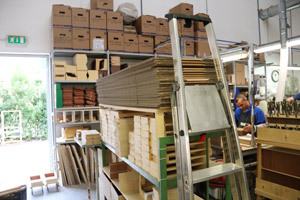 Q: In your production hall – we see a large section dedicated to wood work – this means you are producing your own wooden boxes…. ? 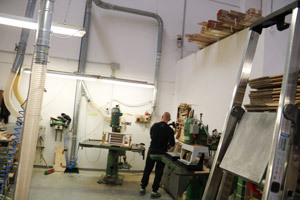 A: We have a big area of our production dedicated to the manufacturing of the wooden parts, the quality of which we are a very proud of too and this quality plant facility gives us more freedom of design too. Due to special and very rigid controls (laws), we do the colouring of the instruments outside our factory. Q: We see a very beautiful poster here on this wall – what is it all about ? Video: From 2:26 is where the accordion is featured.Â Fismen staff picture with accordion. Video above of the Kapelle Sisters (Charlotte Widmer and Ursina Gregori), a cabaret female duo. For their performance they need bellows that measure approximately 10 times longer than normal: 10 x 19 folds = 190 folds. The bellows were produced by Galassi Bellows. 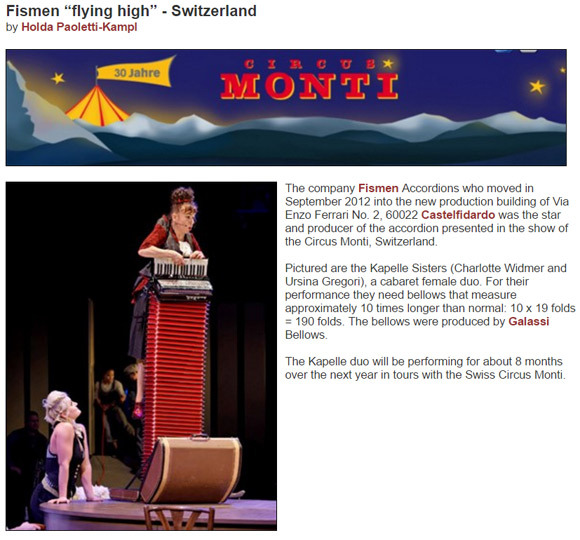 The company Fismen Accordions was the manufacturer of the accordion shown in this video about the Circus Monti, Switzerland. The Kapelle duo will be performing for about 8 months over the next year in tours with the Swiss Circus Monti. Q: Who is making the final control of the instruments before leaving the factory? Q: You also have a third partner – correct? A: Yes – our 3rd partner is Francesco Stacchiotti, who is our YOUNG partner. He started in accordion manufacture only in 1991. Unfortunately he is not in the factory today as he is travelling on business. Q: You your partners have started this business by yourselves, without being born into an accordion producing reality…. do you have children, that might want to step into the business to guarantee a FISMEN future? A: Silvano – with a big smile: there are only YOUNG people working in our factory – the only OLD is us two Luciano and myself. My son Marco – has now been working for several years for us. Lucianos daughter is living in Sicily…. Francesco’s son was just born…. So, the FISMEN future is “assured”. Q: During our visit in your production hall we saw many young people working – did they already have accordion manufacturing / work experience, or do you train them at FISMEN to become skilled handicrafts staff? (One of YOUR FISMEN ;-) ? A: These very skilled staff are our main interest and an assuring solution and investment for our future! 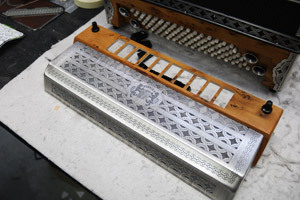 To invest the time and training to build up well inserted handicraft skilled staff for all the many working processes of accordion manufacture, then gives us great confidence, that our instruments will be produced efficiently and on time, and that our instruments will not only maintain our quality and excellence, but can only improve. Samsung Electronics Italia S.p.A promotes the success stories of Samsung Maestros Business solutions with a website with the aim of promoting to future generations the success of the maestros and to support and foster crafts. 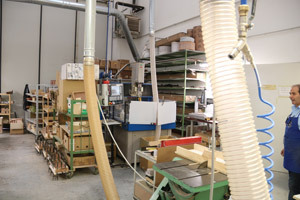 Fismen is a manufacturer that has focused on the manufacturing of the Steirische accordion, a very popular folk music model played in Tyrol, Germany and Slovenia area of Europe. 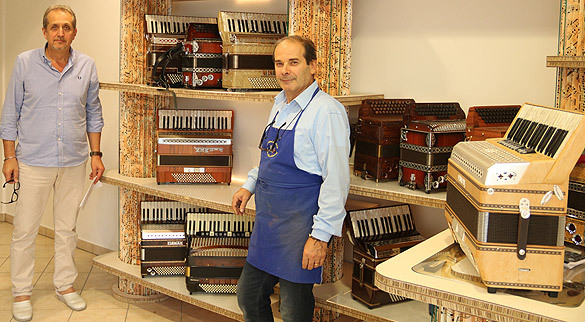 The people at Fisman have most successfully built this type of instrument with its strong cultural tradition and have also considered the prospect of growth and innovation with other model accordions. Q: What do you like most about your activity? A: For us, it is a really big pleasure, when customers are complimenting us upon the quality sound and looks of our instruments. When they pick it up and we see their shiny eyes and large smiles on their face.… then we say : yesssss – well done! 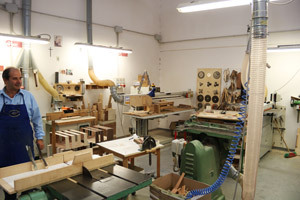 We are always proud, when a customer strolls through the large modern factory and is surprised to find everything in good order, each worker able to show the client « how » we made « HIS » instrument. Our excellent manufacturing facility, well organised, with each worker doing skilled tasks, gives clients trust and confidence, that we understand deeply the importance of quality for the instruments we manufacture and that they can be confident, we can always be of support in case of need.